The Civil Service Fast Stream encourages people from all backgrounds to apply. 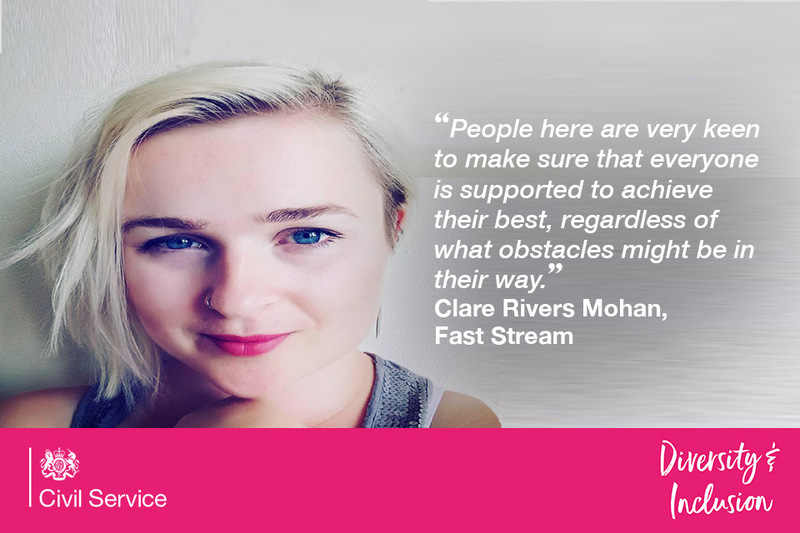 Clare writes about her experience of developing a career in communications on the Fast Stream while managing her mental illness. I’m a third-year communications Fast Streamer currently at the Ministry of Defence. I have complex Post-Traumatic Stress Disorder (PTSD) and Borderline Personality Disorder (BPD). I also ran the London Marathon in April this year and am running another one this month. I’m a collection of various different facets, including my mental illness, and over the years I’ve learned to be upfront about it. It doesn't define me but it is a fairly major part of who I am. I was apprehensive about applying for the Fast Stream with these quite complex conditions. For example, BPD means that I experience every emotion at a higher intensity than normal; managing my feelings is often impossible as they arrive and disappear on the turn of a moment. PTSD, meanwhile, is familiar to many people, often because they are aware that soldiers returning from war zones often have this condition. My body is constantly on red alert, looking for triggers from past traumatic experiences. When triggered, my body shuts down, putting everything into tackling a perceived threat. I have flashbacks, my heart rate soars. All of these things combined mean that when I’m having bad days with my mental health, life is very difficult to manage. I worried that being a member of a scheme as competitive and challenging as the Fast Stream wouldn’t work for me but this is not true. I’ve had lots of support over the past few years from managers who didn’t necessarily understand straight away what I was dealing with, but were open to helping me figure out what worked best to help me be a productive member of the team. In my life not everyone has been great when I’ve opened up about my mental health, but when things haven’t gone smoothly at work I’ve always felt able to talk to my manager or other members of staff and find ways to solve the problem. People here are very keen to make sure that everyone is supported to achieve their best, regardless of what obstacles might be in their way. Things that have helped me include being able to work my hours flexibly; accessing a fixed workspace, rather than hot desking; and working from home regularly. I can get burned out easily so having the chance to sometimes work from home allows me to recharge, focus on tasks, and reset before heading back to the office. Modern technology such as Google Hangouts or Skype mean that my colleagues can always reach me. In fact, I’m doing more than just coping. Alongside many other colleagues with mental illnesses, I’m contributing enormously both to the Civil Service and the Fast Stream. Through the work I’ve done on improving the communications of a small charity to looking at the health and wellbeing of children at a national level, my work is challenging and fun. I’m managing complex and difficult workloads, and doing well. I recently set up the Fast Stream Wellbeing Network. All Fast Streamers are welcome regardless of whether or not you have a diagnosed mental health problem. Everyone should feel able to take charge of their own wellbeing. We have big plans to promote wider awareness of mental health across the Fast Stream. You can sign up to the mailing list by contacting fswellbeing@gmail.com. Thank you Clare for sharing your lived in experience. I commend you for being able to overcome your personal challenges and for joining the fast stream programme. I also wish you well with the launch of your Fast Stream Wellbeing Network. I am a member of the FCO Wellbeing Network that was lauched in 2015. When we initial launched the Group we were unsure as to the level of interest we would generate. Key to our success has been have engagement at the Senior Level and I have to say that I have been grateful to our PUS for the way in which he been visible in his support. We were even able to achieve the Mind Workplace Index Bronze Award in acknowledgement of what we had achieved in such a short period of time both in the UK and in many of our Global Overseas locations. As I type this, I am now working in Istanbul and will be seeking to continue to support our Network and aim to promote my role as a MHFA. So I wish you good luck with your career and the FS Wellbeing Network. I also found Clare's blog interesting along with your reply to her. I have contacted Clare, and I am also looking to you for help as to where I can contribute in the Civil Service to promoting Mental Health and Wellbeing. I too am a MHFA and Counselling Psychotherapist to Diploma level and currently working towards BA Hons Degree in Counselling Solutions, completing in July 2018. I have worked in the Civil Service for over 15 years and I want to contribute my skills and knowledge in this area. If you would like to send me your contact details to gavin.thomas@fco.gov.uk, I will forward them onto the FCO Wellbeing Network based in London. Thank you. I’m really pleased to see this launch as it’s so an important area to provide information, sharing of good practice and understanding. I completed the Fast Stream in 2010 and moved to my my first G7 role. I can remember the feeling of abrupt dislocation resulting from moving from being part of a small cadre of people in the department with regular social processes (informal like drinks and formal like regular training events) to bring them together and a sense of s clear identity. That changed very quickly to just being a G7 in a directorate, and a new and inexperienced one at that, with no similar social processes and it was a big challenge, happily one I managed to overcome. It might be good to for the network to consider how to promote well being amongst those just leaving the schemes. Happy to discuss further if useful. Thank you for your excellent work Clare, every department should have staff mental health networks (and that includes the cross-department schemes). Great, brave blog. I joined the Fast Stream in 2010, and now work as a G7. I have suffered with depression and anxiety since university. I have very rarely disclosed my illness to work colleagues, but have been pleased to see the civil service taking mental health more seriously over the last few years. There's still a long way to go - we still tend to value and reward over-work, which can be impossible or damaging for those with stress-relayed illnesses. Very brave Clare, well done. Good luck for the future. Thanks Clare, very brave and helpful.